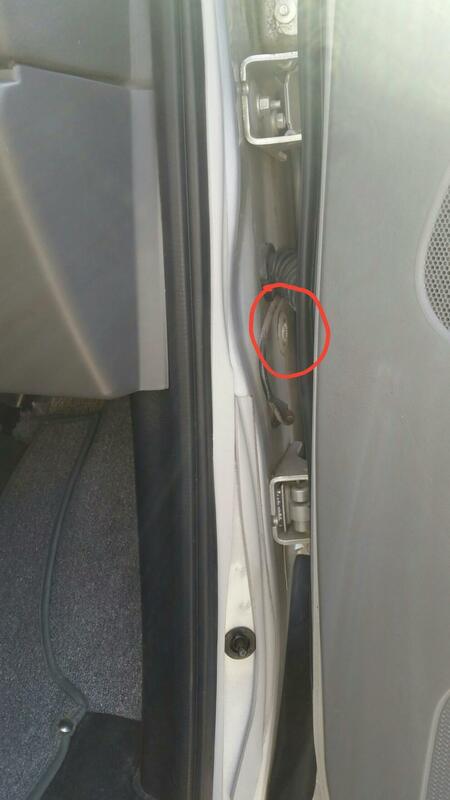 At the time, I had noticed occasional moisture on the driver's side floor, and I figured that it must be related to the windshield/body seam issue. A lively discussion followed; a number of folks reported tracking down and resolving variations on this theme. Forum member JWA has been really helpful to numerous folks in this regard. ...I tracked it down today. It is not the windshield issue, but it is something that I'm guessing may be affecting more vans than mine. Ford puts a hole through the inner fender, and seals it with a grommet. That's good, because when it rains, water sheets down that surface, and the hole opens up to the inside of the van, behind the footwell kick plate. 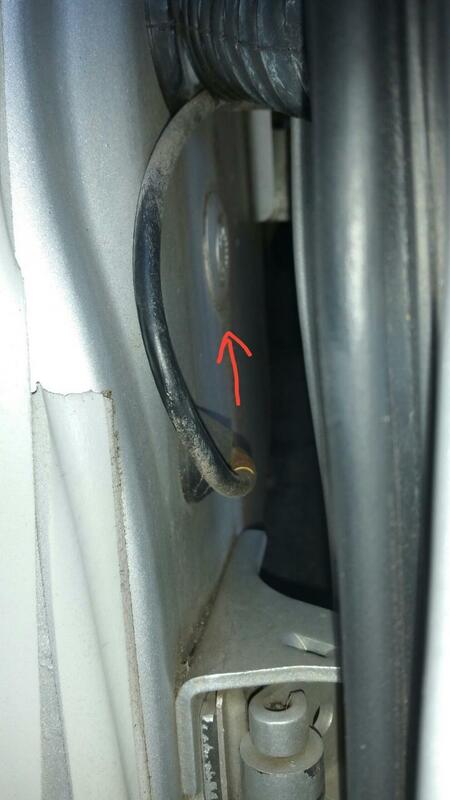 That hole is perfect for running wires from the engine compartment to the interior of the van--and that's exactly what SMB did on my driver's side. Through that hole, I have a 6AWG wire running from my chassis battery to the wire separator under the gaucho, as well as two control wires for my Starcool system. When I run water against the outside of the van, it sheets down the face of the inner fender, and seeps into the van along the red battery cable, because that hole is not properly sealed. SMB, I love y'all, but this is not good. 1. Remove and replace the 6AWG battery cable with a larger gauge wire. I was going to do this anyway. 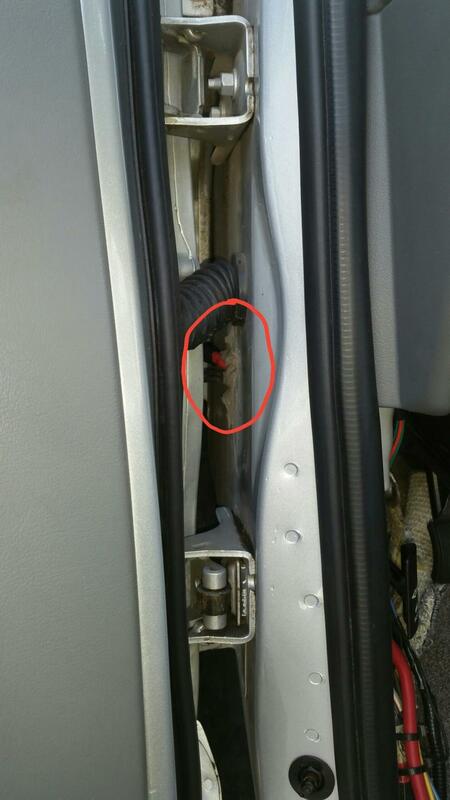 The new wire will not enter the van through this hole. I'll run it under the van, and up through another existing hole under the gaucho. 2. 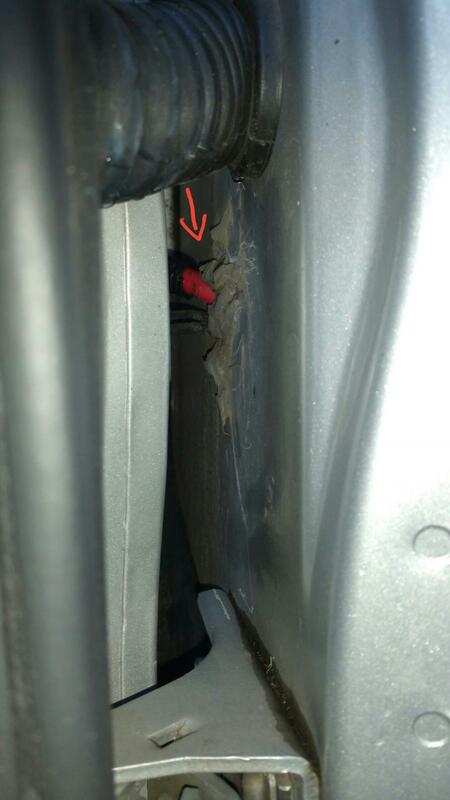 Pull the two black wires, and re-route them through existing holes in the footwell instead of the hole in the inner fender. 3. Cuss a bunch as I'm cleaning up all of the existing silicone, because it is dang difficult to access that spot, and SMB should have known better. 4. Seal the hole with a new grommet. 5. Never run wires through that location again. Has anyone else done something similar? Thoughts? Any easier to reach that spot with the fender liner out? Removing that small piece of plastic in the inner fender gets you access to that area up in there... I just don't remember how far up you can reach. Might be worth a shot though, the fender liner is easy to remove. Thanks, MG. Yes, Eric and I contemplated the same thing. Unfortunately, doing this does not provide useful access. Pulling the fender would. After I remove the wires, if I can't get the area clean enough to be able to seal it up with a grommet, I think that's what I will need to do. But I think I can make it work by reaching in from the door opening. One thing's for sure: I will be happier once I am no longer running wires through that hole. Just not a good place, given how exposed it is to water. If you decide to pull the fender be sure to put several alignment marks on both the body and the fender. The marks will help get the fender back in the same place. Thank you, larrie. I have zero experience with body work, so advice in this regard is much appreciated. Today, I removed and re-ran the two smaller wires. For the battery cable, I need to acquire some 2/0 to replace it with. Once I have my new wire, I'll be able to pull the battery cable out of there, and then seal the hole. Regarding my new wire: It looks like I could go with SAE J1127 welding wire, with a choice of EDPM, Polyethylene, Neoprene, or PVC insulation, or I could go with UL1426 tinned copper marine cable, with a choice of Vinyl or PVC insulation. Anyone have any thoughts on the pros and cons of each? I used welding wire with EPDM. Welding wire is incredibly flexible compared to other types of wire. Let me know if you need a second set of hands. Thank you, larrie! I might take you up on that offer...fishing 2/0 cable through tight spaces is definitely easier with two sets of hands. Where did you get your welding wire? Do you have a source for quality wire at a good price? Why not pull the wire through the firewall, and lose the half assed hole through the grommet entirely? That's pretty much what I am doing. I've re-routed two of the wires already. I'm going to replace the third wire with a larger one, so I'm going to wait until I have the larger wire. Once I have it, I will run it in a new location, and not through the grommet hole. Then I will seal up the grommet hole with a new grommet, and all will be well again. I don't really want to drill a hole in the firewall to run the new wire. I'm planning on running it down through the floor of the van, along the frame for a short distance, then up into the engine compartment. That's what I did with the other two wires, and I'm perfectly happy with that approach.